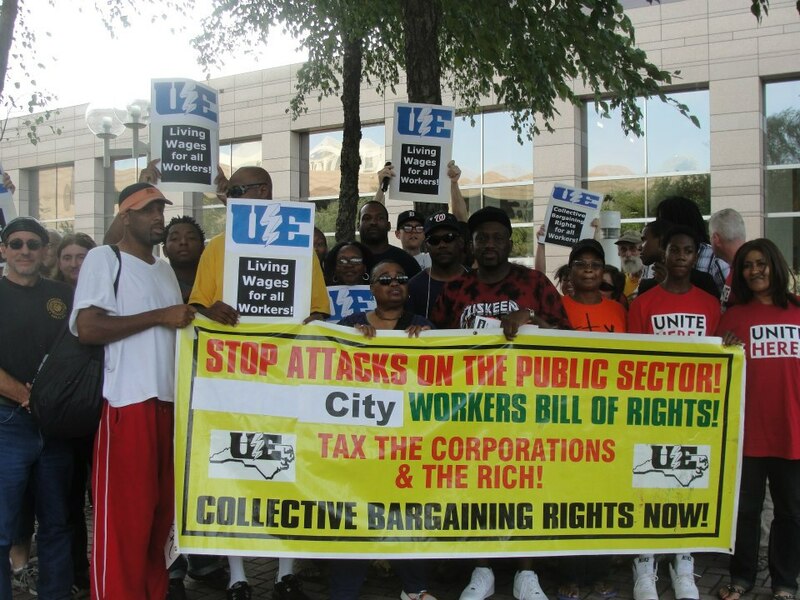 Sign to tell the DNC and City of Charlotte: Rights for Charlotte City Workers NOW! Click HERE to sign and send a message to the Charlotte City Council, the Obama administration, the Democratic National Convention Committee and others, telling them you support the City of Charlotte workers’ demands for a city ordinance enacting a City Workers Bill of Rights. Dr. Martin Luther King Jr. was killed in 1968 standing with striking sanitation workers in Memphis, TN demanding basic union rights. Yet, still today, workers in North Carolina are denied the basic right to collective bargaining. Charlotte City workers have been forced to work 12 hour days 6 or 7 days a week in preparation for the Democratic National Convention and are given harsh disciplines for minor infractions such as running over a curb. Meanwhile, the City Manager recently gave himself a hefty 2nd raise for the year, totaling over $20,000. The attack on collective bargaining that was observed this past year in Wisconsin, Ohio, Indiana and beyond was an outgrowth of the unsolved battle against Right-to-work (for less) laws that still plague the US South. Now the Democratic National Convention is being hosted in the least unionized state. Charlotte is also home of more banks than anywhere outside of New York, this is why organizers are calling it the Wall Street of the South. Yet, this rich city cannot find enough money to give the workers a decent raise or recognize their demands for a City Workers Bill of Rights. Over the past few weeks in the lead up to the Democratic National Convention, Charlotte city workers have been picketing city council demanding recognition of their basic worker rights. As the City of Charlotte uses its status as host of the DNC to boast that it is a world-class city, the rank-n-file workers that keep the city clean and safe are being denied their basic rights at work. UE local 150, NC Public Service Workers Union has released the below open letter to the Obama Administration, Charlotte City Council and state elected officials to honor and enact a Municipal Workers Bill of Rights ordinance and to follow through on the ruling of United Nation’s International Labor Organization ruling to repeal ban on collective bargaining for public employees. City workers are are campaigning for the adoption of a City Workers Bill of Rights so that they have decent working conditions and be paid a decent wage for their hard work. UE150 union members are also requesting representation in grievance hearings and also voluntary payroll deduction for workers that choose to join the union. The United Nation’s International Labor Organization (ILO) found North Carolina’s ban on collective bargaining to be in violation of international labor standards. In that decision the ILO called on the United States government to “promote the establishment of a collective bargaining framework in the public sector in North Carolina” and called specifically for the repeal of NCGS § 95-98. The City of Charlotte does have the authority to meet-n-confer with the union and grant other basic union rights such as pay roll deduction, as is done in at least three other cities across the state and for all state employees. ATTEND THE SOUTHERN WORKERS’ ASSEMBLY, MONDAY SEPT 3, 1-5 PM, Wedgewood Baptist Church, 4800 Wedgewood Dr, Charlotte, NC! Go to http://southernworker.org for more info. 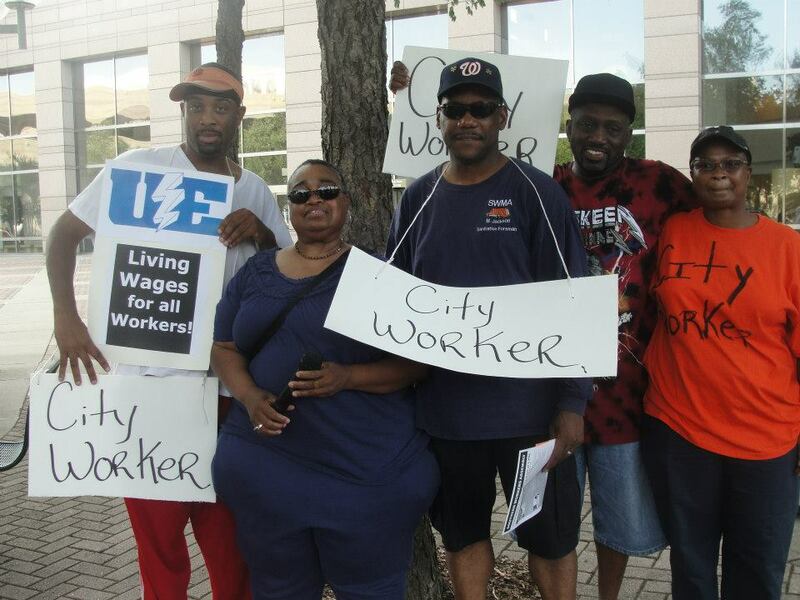 Click HERE to sign the online petition for wokers rights for Charlotte City Workers!